At some point in life, almost everyone has had the impulse to pack up their necessities, kiss their daily stresses and worries goodbye, and become a “carny”. It’s hard to deny that the carnival is a magical place. For adults and children alike, it has been a wonderful form of escapism for decades, letting the carnival goers leave the humdrum nature of reality behind, and lose themselves in a world of exhilarating rides, lively games, and captivating performers. Amongst the echoes of laughter and screams of delight, it’s hard to resist smiling broadly as you walk through the crowd of fellow elated attendees. At Celebration Source, we bring the carnival to you! Providing the best party entertainments in West Miami, our job is not complete without a smile on every single face, just like a carnival is not complete without… carnival food! Whenever you take a bite of cotton candy or a candy apple, no matter where you might be, you can simply close your eyes and hear the whimsical sounds of that enchanting environment. But where did some of these foods originate? It’s not like there is a cotton candy tree (except for in our dreams). Let’s take a look at some of our favorite carnival treats and the history behind them. Of course you know that popcorn has been around for ages. 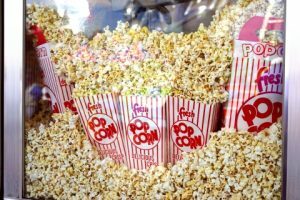 From circuses and, of course, carnivals, to being the go-to treat at the movies, people across the world have been enjoying the buttery snack for years, but just how long has popcorn been around? The answer may surprise you. While we don’t know the exact time that popcorn was conceived, corn has been domesticated for up to 10,000 years, and remains of popcorn have been discovered that date back to 3,600 B.C. It has also been found that popcorn was a popular snack of Native Americans, and this was adopted by the colonists immigrating from Europe. Obviously, the enjoyment of this easy-to-make treat did not fade over time. In 1848, John Russell Bartlett’s Dictionary of Americanisms included the term “popcorn” (it’s probably fair to assume that we don’t have to go into the history of how popcorn got its name). While stovetop popcorn was popular throughout the 19th century, the popularity and accessibility of it radically increased in the 1890s when a man by the name of Charles Cretors invented a mobile steam powered machine that had the ability to pop the kernels. This coincided with the rise of cinema, and became a popular treat at the theatres. Apprehensive at first, thinking the food would distract from the films, cinema owners eventually came around and in 1938 they began installing popcorn makers in their lobbies for moviegoers to enjoy. Even during the Great Depression, due to its affordability, popcorn thrived. There was no going back. For thousands of years mankind has enjoyed popcorn, and the indulgence isn’t likely to go away. Popcorn has become a staple for movies, circuses, carnivals, and all things fun. If you don’t like popcorn, you might not be human. Just the thought of biting into a succulent, juicy candy apple can make the mouth water. While in hindsight it seems so logical to combine one of the most delicious fruits with candy (duh), the sweet treat wasn’t created until 1908. Candy-maker and now hero to all sweet enthusiasts around the world (where’s his statue? ), William W. Kolb was experimenting in his shop with cinnamon candy during the holiday seasons. Divine inspiration struck, and Kolb began dipping some apples into the mixture and putting them on display. Candied apples were an immediate success and began being distributed along the Jersey Shore, and soon after became one the most popular products at circuses, carnivals, and candy shops across the United States. Surprisingly, it took about 50 years before caramel apples joined the ranks of some of the best carnival foods available. In a similar situation, an employee at Kraft Foods was messing around with a surplus of caramel from Halloween and decided, what the heck, and began dipping apples in the melted caramel. One bite and he knew he had just changed the realm of candied apples. 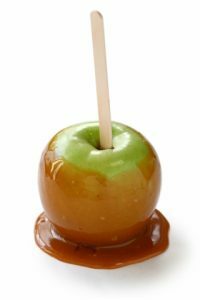 Caramel apples began to be widely distributed in the 60’s. As simple as they are, sno-cones are one of the most refreshing goodies to partake in on a hot, summer day. So what genius (and we don’t mean this sarcastically) came up with the idea? First, let’s take a trip back to the 19th century before revealing this godsend’s name. During the American Industrial Revolution, ice first became available commercially. In order to send large blocks of ice to warmer clients, “ice houses” utilized wagons to transport the blocks. This had people losing their minds, in a good way. Could you imagine a world where ice wasn’t readily available to you? No thanks. By the late 1800’s, “snowballs were being used to cool down customers in theatres and similar venues. But it wasn’t until 1919 that the sno-cone as we know it came into existence through a Texan man by the name of Samuel Bert. Appropriately nicknamed “King Sammie”, Bert began utilizing an ice crusher machine of his own making and adding syrup to crushed ice. He began by selling his concoction at the State Fair of Texas, and over time, sno-cones became a hit. In the beginning of the 1950s, it was estimated that King Sammie was selling up to a million sno cones per year, and the treats are still a carnival favorite to this day. From the bottom of our hearts, thank you King Sammie. 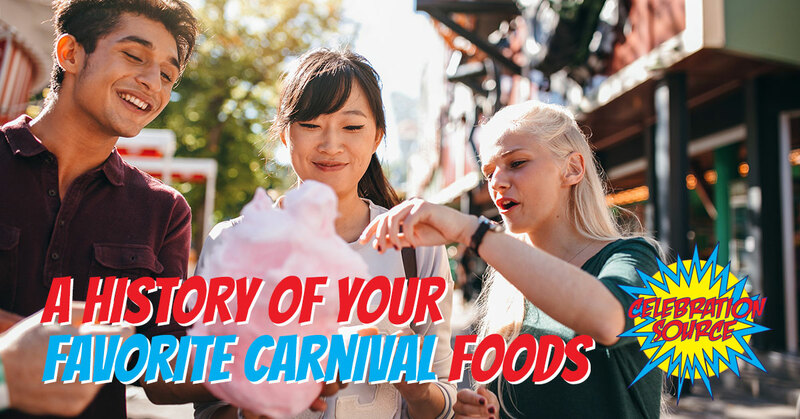 While carnival games, rides, and performers, provide the fun and entertainment, it wouldn’t feel the same without indulging in some delicious carnival foods. Now that you’ve read about the history of some of these treats, we do not apologize for the craving that you’re feeling, maybe it’s time for a carnival? At Celebration Source, our party entertainments in West Miami bring the carnival games, rides, and of course food to you! From neighborhood festivals to school events, we promise to bring the fun. Think you’re too old for a carnival? Think again! We also provide corporate events guaranteed to engage your employees and let them free their inner-child. What are you waiting for? Call us today!